It’s the most wonderful time of the year! That is, if you happen to love autumn, as I do. The leaves are changing colors, it’s cool enough to wear scarves again, and the time is right to watch repetitively It’s the Great Pumpkin, Charlie Brown. Speaking of great pumpkins, have you yet stocked up on all of the cans of pumpkin that you’ll need for the next three months? If not, I trust that you’re working on it. 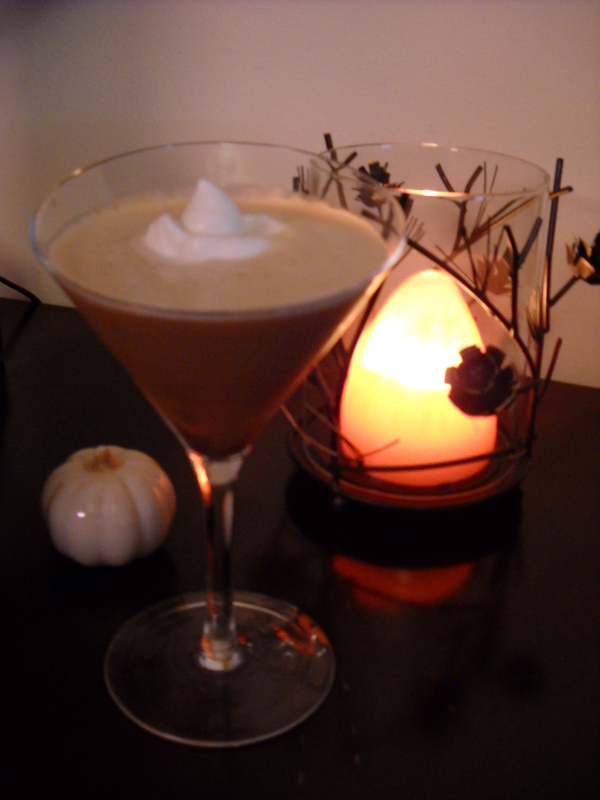 While you’re gearing up to make the first of many pumpkin pies, why not really get into the spirit of the season with a little pumpkin pie cocktail? Yes, please. This easy-peezy martini has all of the flavor of pumpkin pie and takes a fraction of the time to assemble and serve. It involves pumpkin, spices, and a milk product, just like the real thing, but with the pleasant additions of Kahlua and butterscotch schnapps. If you don’t yet have Kahlua and/or butterscotch schnapps on hand, I highly recommend investing in both; they both can be used throughout the holiday season(s) to make any number of festive cocktails. For now, however, let’s focus on making this liquid pumpkin pie dream a reality. Halfway fill a cocktail shaker with ice cubes. Atop the ice, ad the Kahlua, butterscotch schnapps, milk, pumpkin, and pumpkin pie spice. Gently mix with a spoon to start to incorporate the pumpkin and spices. Vigorously shake the shaker for 30 seconds. Pour the contents of the shaker into a martini glass. If you like, garnish the cocktail with whipped cream. Enjoy!